The number of years that elapse before the children of one set of human beings arrive at a marriageable age. This number has been defined to be equal to the average male age at marriage, plus one year before child-bearing begins, plus half the average number of years during which fecundity lasts. As a rule, Jews marry much earlier than the rest of the male population among which they dwell, probably owing to the rabbinic requirement that a man should marry before attaining the age of twenty (Ḳid. 29b). On the other hand, their fecundity is greater; therefore the time of fertility of the female is longer; but exact figures concerning this detail are not available. 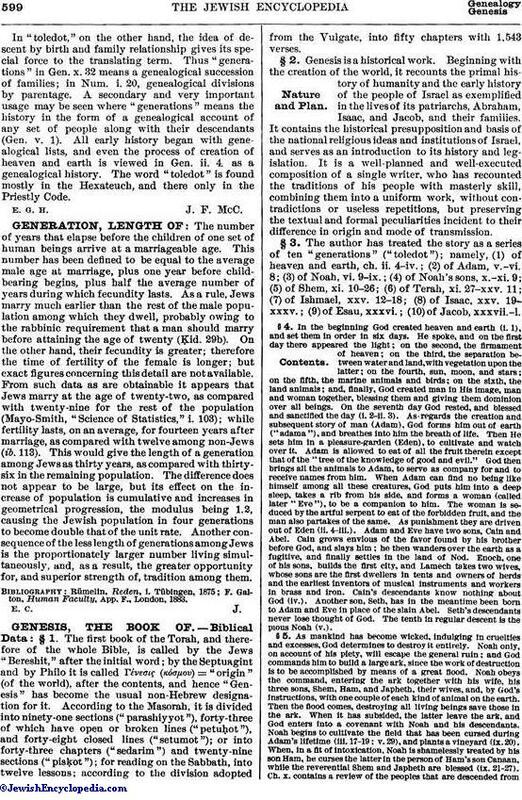 From such data as are obtainable it appears that Jews marry at the age of twenty-two, as compared with twenty-nine for the rest of the population (Mayo-Smith, "Science of Statistics," i. 103); while fertility lasts, on an average, for fourteen years after marriage, as compared with twelve among non-Jews (ib. 113). This would give the length of a generation among Jews as thirty years, as compared with thirty-six in the remaining population. The difference does not appear to be large, but its effect on the increase of population is cumulative and increases in geometrical progression, the modulus being 1.2, causing the Jewish population in four generations to become double that of the unit rate. Another consequence of the less length of generations among Jews is the proportionately larger number living simultaneously, and, as a result, the greater opportunity for, and superior strength of, tradition among them. F. Galton, Human Faculty, App. F., London, 1883.